WomenCircles can always be customized and hosted in the privacy of your own home or at a place of your choosing. There are essential conversations that touch our hearts and speak to our souls. These dialogues are rooted in our deepest awarenesses and longings, in our truest and most authentic Self. Yet, even as we hunger to be part of meaningful connection, we sometimes do not know where or how to create the appropriate time and environment so that these magical opportunities for sharing and exploration can emerge. 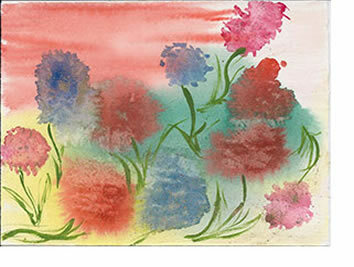 The poet Mary Oliver asks, “Tell me, what is it you plan to do with your one wild and precious life?” Take time out of your already always busy life to revisit, recharge, and recommit to your Best Self. Join Coach Minx at the WomenCircle – a journey of easy camaraderie, joyful exploration, deep reflection, and Self discovery. Where: Kaffee’s Garden Spa at 4100 South Dixie Highway in West Palm Beach OR in the privacy of your own home or office. Experience Life Coaching in an Exciting Way. Host or Join an Empower Party™! Empower Parties are unique group coaching experiences filled with inspiration, empowerment, and fun. They last about two hours and include supporting materials that will help you apply new ideas and inspiration to your life after the party. As your coach facilitator I will send you a thought-provoking exercise ahead of the event to help you consider the possibilities in advance, ensuring a rich and valuable experience that will help you make the changes you want in your life. The transformation game is a 2 day experience for 4 players . It can be played in the privacy of your own home or in a place of your choosing. One of the unique niches of my coaching practice is in the area of transformative awareness. Rigorously trained as a facilitator of the Transformative Game® by its creators, Joy Drake and Kathy Ty ler from Findhorn, Scotland, I utilize the advanced version of this board game as a way to jump start an exploration for those who are in transition and searching for a new awareness and direction. Based on the principle that the Universe responds to our clear intentions, players begin by setting a playing focus, which serves as the context for their game. 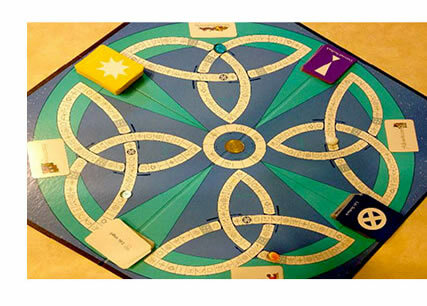 Centered around a board with individual “life paths” symbolizing each player’s world, the Game allows seekers to explore the deepest levels of their being and receive guidance and inspiration. The Game is a powerful interactive tool, offered in a stimulating, and supportive group setting in which openness, cooperation, and sharing are encouraged. As a coach and facilitator, I guide each player to draw forth their wisdom and creativity. As a follow-up, traditional individual or group coaching sessions are offered, so that the experiences of the game can be used as a springboard for personal growth and development at any stage on life’s journey. Intuitive Solutions® provides a delightful hour or so of exploring one’s inner ocean in this special way. It is based on the Transformation Game® which is a sophisticated and multifaceted opportunity for thinking out of the box and incorporating one’s inner wisdom in making vital choices. This program introduces participants to these tools and shares ways that they might be useful in one’s personal and professional life. WomenCircles can also be customized and hosted in the privacy of your own home or at a place of your choosing.